SSBJK Jobs Notification 2019. Online applications are invited from eligible candidates for participating in the selection process for State Cadre Posts of Department of Law, Justice and Parliamentary Affairs and General Administration Department. i) Graduate from any recognized University with knowledge type writing having not less than 35 words speed per minute. (i) Graduate from any recognized University having minimum speed of 65 and 35 words per minute in shorthand and type writing respectively. (ii) Six months certificate course in Computer Application from a recognized Institution. Department: Department of Law, Justice and Parliamentary Affairs and General Administration Department. a) Date of Commencement for submission of online applications = 06-03-2019.
b) Last Date for submission of online applications = 28-03-2019. Fee of Rs. 350/-(Rupees Three hundred and Fifty Only) by Online payment gateway or Challan or CSC Connect. (It may be noted that there will be nominal additional transaction charges in case of online payment gateway and Challan options. In case of CSC Connect option, additional charges for filling form, print outs etc., will also be taken by concerned CSC Operator). 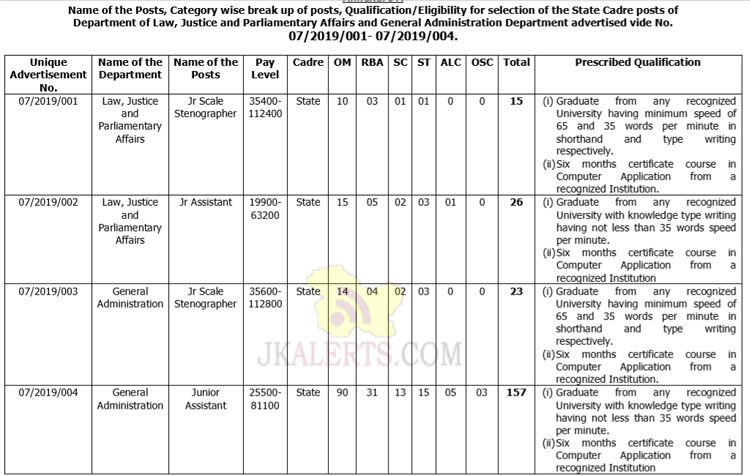 Candidates are required to apply online through JKSSB’s online Application Portal www.ssbjk.in.